Management guidance on how to build your company's analytics practice. 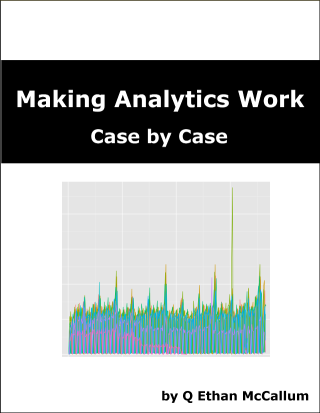 Welcome to the companion website for the book, Making Analytics Work: Case by Case. As the book is still in-progress, I'm using this space to answer some questions and report progress. What book is this, now? Making Analytics Work will explore how to build a data analytics practice inside your company, from a management perspective. Each chapter will present guidance on a particular topic, such as "how to build your analytics team" and "choosing your data storage platforms." In recent years, the idea of data analytics (sometimes known to as "Big Data," "data science," or simply "analytics") has become very important to businesses of all domains and sizes. There are now plenty of resources for hands-on data practitioners -- including conferences, books, and training -- yet, there's scant help for people in leadership roles. Where do you turn if you're responsible for those important, strategic decisions behind building an analytics practice in your firm? To make that happen, I'll need your stories! Please let me know if you'd like to contribute. I have a story to share! How do I contribute? Great! I'd really like to hear from you. Please send me an e-mail at ideas@makinganalyticswork.com and I'll contact you straight away. Q Ethan McCallum will write the book, with O'Reilly Media as the publisher. Ann Spencer will be the book's editor. The author appreciates Mike Loukides providing his guidance and shepherding this book through the proposal process. At the moment, I'm interviewing leaders of various companies to better understand their experiences. Once I've concluded these interviews, I'll begin the actual writing process of distilling those stories into chapter topics. Sounds like I could really use this book right now. What do I do? I understand that not every leader can postpone their analytics plans until the book arrives. For more immediate guidance, my consulting practice focuses on this very topic. Please visit my website for more details. Copyright 2014 Q Ethan McCallum.